We all know how important patient information is – but in a busy clinic it can be hard to know how effective our education has been. We developed this scenario-based rapid learning to refresh your delivery of patient information using animations full of simple and practical tips that reflect evidence-based best practice. There is growing recognition that young people aged 15-25 years with cancer have biopsychosocial support needs that are different from those of other age groups. Our new module, developed by the ONTrac at Peter Mac Victorian Adolescent and Young Adult Cancer Service, will help you understand your unique role in supporting young people with cancer into healthy survivorship and beyond. It’s a season for summaries. Course summaries that is. We’ve added key point summaries to three of our courses. What could be better than that? ...you can print them for easy reference! Our Cancer Medicines course summary is available now. The document provides a summary of the module content in a readily accessible format for community pharmacists. From general principles to adverse effects and patient education, refresh your memory on oral anticancer medicine use here. Have you recently completed the Adult neutropenia, fever and sepsis module? Do you remember all the causes of fever during neutropenia? How do you manage adult fever and neutropenia? A short summary of information contained in these learning activities is available to refresh your memory. You can view or print a copy here or from the course landing page . Not only have we added a printable summary to our Immunotherapies course, we’ve added an eQuiz to test your learning! What do you remember from the immunotherapies course? What have you forgotten? Take our mini quiz to find out or read the new course summary for a quick refresh—or even better, do both! An increase in urgent immunotherapy treatment-related symptoms has led to the development of a patient alert card and pathway for the Loddon Mallee region of Victoria. The project was led by Sue Bartlett who worked with four participating health services, an experienced melanoma specialist nurse from Peter MacCallum Cancer Centre and a consumer living in the Loddon Mallee to develop a wallet sized patient alert card and patient pathway specific to the Loddon Mallee Region (LMR). 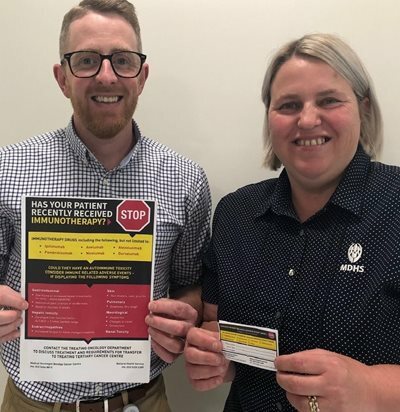 This patient alert card and pathway has been rolled out over four sites including Bendigo Health, Kerang & District Health, Maryborough District Health Services and Swan Hill District Health, who have participated in over 22 education sessions to GP’s and Emergency Department staff. The project was funded by the Loddon Mallee Integrated Cancer Service. New facilitators – Introductory webinar focussing on navigating the facilitator toolbox and course resources. Previous experience – Q&A style session, tailoring information to participant needs. Non-cancer setting – Introductory webinar focussing on navigating the facilitator toolbox and course resources. Check the facilitator training calendar for up to date details. Are you a health or community worker who works with Aboriginal people affected by cancer? If the answer is yes, you might like to join the Cancer Institute NSW Aboriginal Cancer Network. 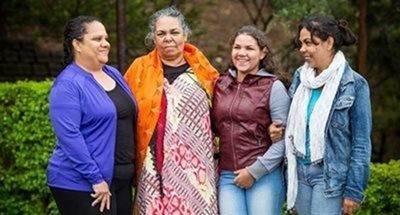 The network includes Aboriginal community members and consumers and provides a great opportunity to meet with people impacted by cancer as a patient, carer or support person. It’s free to join and membership gives you free access to the 2019 Aboriginal Cancer Network Forum which will highlight best-practice models of care to improve cancer outcomes for the NSW Aboriginal population. Will you be attending the ASMIRT conference at the Adelaide Convention Centre this March? If so, come and say “Hi” at the eviQ / eviQ education booth. We'll be strategically placed between two coffee stations at booth 28. ​ Subscribe to receive rapid learning updates direct to your inbox. Facilitator training (online webinar): Register for our next online facilitator training on Tuesday 19 February 2019 (non cancer setting) from 1.00pm – 2.30pm (EST) - Introductory OR Tuesday 26th February 2019 from 1.30pm – 2.30pm (EST) - Experienced. Please email us on eviqed@eviq.org.au to book your place and receive webinar login details. Share the love: If you have a colleague who may be interested in receiving this monthly update – please invite them to subscribe! Once you have passed the eQuizzes you will have to complete a face-to-face competency assessment. Speak to your local facilitator or educator for more information. Cancer is the leading cause of disease related death in young people aged 15-25 years, second only to accident and suicide. Learn about Youth focused cancer care and life after cancer in our new course Community-based cancer care for young people: the role of primary care nursing.